Mist areas to be treated two hours prior to storm. This prevents the first 1/2 inch of snow from building up. This will continue to work up to 14 days as long as there is no rain. Product will work to 50 degrees below zero. Apply product any time after a storm; Liquid Ice Melt will sink to surface, dissolving snow or ice for easy cleanup. Buy 3 and the 4th one is FREE! 5 gallons covers 6,000 square feet. 55 gallons covers 66,000 square feet. This easy to apply, labor saving product is a blend of ice and snow melting chemicals with special inhibitors designed to reduce to a liquid any ice or snow into which it comes in contact. When applied as recommended, it melts ice and snow immediately. This ice melt is designed to be safe on aluminum and all metals and is made with special rust preventatives to be effective in freezing and sub-freezing temperatures. This Liquid Ice Melt quickly penetrates and dissolves frost, snow and ice accumulations, and prevents further build-up. It will not cause damage to or form residue on asphalt, concrete, terrazzo, aluminum, steel, plastic, rubber or painted surfaces. Use it on stairs, sidewalks, driveways, bridges, ramps and loading docks where ice and snow post a safety hazard. It also prevents the freezing of locks, chains, hinges, linkages, controls, coal conveyors and equipment. Simply put in a 2-gallon sprayer and apply sparingly directly to the affected area. Wait a couple of minutes and reapply for best results. ELS Liquid Ice Melt lowers the freezing point of water and penetrates ice for faster melting action. Simply spray, sprinkle, pour or swab onto the surface to be deiced. On glazed ice, scoring the surface will help prevent run-off and speed melting. However, this liquid ice melter can become diluted as it works, and reapplication may become necessary. Also mix with sand to improve traction on drives, parking lots, sidewalks, docks and entry ways. Treated sand gives triple the traction, will not freeze in trucks or spreaders, and will not blow away. Use 5 to 10 gallons per cubic yard of sand. Spread 1 yard of treated sand over 50,000 - 60,000 sq. ft.
Great for leaders and gutters, metal and asphalt roofs and other hard to reach areas! A blend of environmentally friendly ice and snow melting chemicals with special inhibitors designed to reduce to a liquid any ice or snow into which it comes in contact. When applied as recommended, it melts ice and snow immediately. This ice melter is designed to be safe on aluminum and all metals. It is made with special rust preventatives to be effective in freezing and sub-freezing temperatures. Fast acting safe ice and snow melting compound. An exclusive formula of ELS Products Corp., ELS Ice Melt was designed to make snow removal easier and faster. It's ideal for parking lots, driveways, sidewalks, porches and patios. Ice-Melt contains dust controlling and anti-caking agents and also ends most tracking. This formula will not harm lawns, trees or shrubs when used as directed. 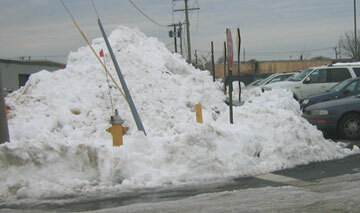 Use less with Ice-Melt and see the snow melt away faster than ordinary deicers. 100% environmentally safe, Ice-Melt is the only snow and ice melter that reduces freezing damage to concrete. Urea blend. Will not harm grass or foliage when used according to directions. ELS Safety Ice Melt will safely melt built-up ice and snow at temperatures down to 59 degrees below zero. Contains no rock salt or calcium chloride. Highly concentrated - melts 35 times faster than salt at 1 degree F.
Applications work up to 6 hours, less need to reapply. 100% environmentally safe. Will not contaminate ground water. An exclusive formula of ELS Products Corp.